Big topics are converging as Toronto's spinners, enthused by a new power in Ottawa, work a yarn to justify raising revenue for the government and to gloss over the massive waste in the electricity sector since 2008. Climate change has been called a wicked problem, but that's usually ignored when tidy, if false, solutions get presented. Two of those solutions are Cap and Trade everywhere, which is of particular interest to Ontarians now, and the U.S. Clean Power Plan -which Ontarians are getting told they might benefit from. Two Cap and Trade initiatives cited in the editorial are the California centred Western Climate Initiative (WCI) and the U.S. northeast's Regional Greenhouse Gas Initiative (RGGI). A couple of years ago the U.S. Energy Information Administration (EIA) wrote on the RGGI. From the graphic I guess one could conclude it had been super super great as emissions were far below cap - or one might think the cap was set far too high, particularly if one reflected on why cap space continued to be held by the emitters allocated the emissions allotment (and/or traders), and not sold to somebody wanting to emit. I thought, examining this graphic, it looked like the new lower cap was still likely to be above "business as usual" emissions, particularly as similar banked credits have been a source of contention in the European Union's Emissions Trading System (EU ETS) - so, on twitter, I asked the EIA, and was politely told who to contact for more information - but I wasn't looking for more information, I was looking for a firm "no", and not receiving one, I was not inspired to pursue study of the RGGI scheme further. I perceive the RGGI as a scheme to protect incumbents - I do not seen it as an instrument creating a market for low carbon electricity. Perhaps Ontario and Quebec see it similarly as, despite exporting 40 billion kilowatt-hours of electricity to neighbouring states in the RGGI, they are inclined to join California's WCI scheme instead. Californians seem to reduce emissions like they are often shown to landscape - they find somebody else to do most of the work. The most recent emissions inventory from the Air Resources Board of the California Environmental Protection Agency covers from 2000-2013. 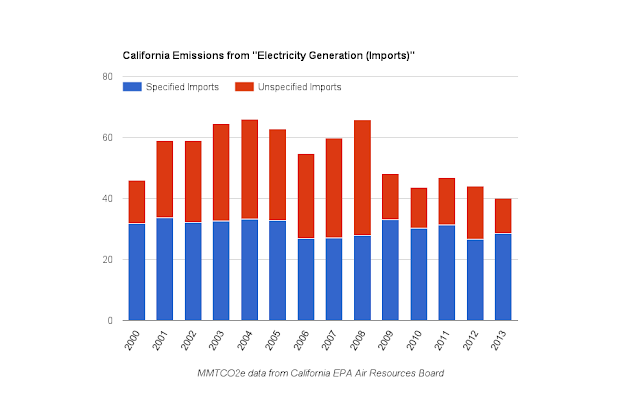 Following Copenhagen I tend to look at a 2005 base, and since 2005 78% of California's reduction in emissions came from the "Electricity Generation (Imports)" sector. Drilling down into the data further, 81% of the reductions in the "Electricity Generation (Imports)" sector came from the "Unspecified Imports" category. This is my Ontario's chosen cap and trade partner. If you’ve installed solar at your home and are now basking in the I’m-saving-the-planet warm glow, you may be in for a splash of ice water. There’s a good chance someone else has purchased your halo and is wearing it right now. You see, in practically every state, rooftop PV is recognized as green with Renewable Energy Certificates (RECs) that correspond to the amount of electricity they produce. But if you are leasing the panels or buying the electricity they produce under a power purchase agreement, then the third-party owner (TPO) of the system gets the RECs. Most TPOs are selling those RECs to another electricity vendor or customer, who can match them up with power from a “brown” source and magically turn those brown electrons green. Here’s how it works: Joe’s Solar puts a 5 kilowatt system on your roof and sells you the electricity under a power purchase agreement. Because Joe owns the panels, he gets credit — in the form of RECs — for the 7000 kilowatt-hours (kWh) of renewable electricity it produces each year. Meanwhile, Bob’s all-fossil utility wants to “green up” so it buys the RECs from Joe to match with its coal or gas-fired generation. Then Bob can claim that 7000 kWh of its power is renewable. It's a little more complicated, and less progressive, than this. Solar City is the most prominent example of a company that exists largely to haul in RECs and utilize Investment Tax Credits (ITC) a consumer installing their own panels could not. It is possible California's "unspecified imports" showing reduced emissions are importers buying REC's from solar installation owners - who often differ from the people with the solar panels on their roofs. If the REC's are to track getting x% of the total from renewables, you can use an REC to make coal renewable. There are rules, in places, against third-party-owners claiming they are providing the house on which they are installing solar panels with clean renewable energy - the clean is the RECs and the RECs have value to greenhouse gas emitting generators. The New York times editorial declaring Proof That a Price on Carbon Works doesn't contain evidence supporting the claim unless we take seriously claims B.C. 's carbon tax does reduce emissions. I'm not inclined to get into my interpretation of that aside from noting B.C. 's aim was revenue neutrality and my understanding is that was overshot. I doubt there's many arguing that province's carbon tax is proof that tax cuts work, but if the measurement is economic performance that may be valid. In the short term the accomplishments are as likely to be from the anti-emissions advertising value from introducing a tax to promote reduced consumption as to be from the minor consumption reduction economist would expect from a minor increase in pricing. British Columbia's young carbon tax has been the subject of at least one study finding early success, without harm to the economy, but as one critic noted, respondents to a survey had generally not noticed any impact of the tax on consumption and had no knowledge of changed emissions - but they liked that there was a carbon tax. Since 2012 its been claimed BC's tax worked but isn't anymore - with calls to raise the carbon tax. If this was a serious field of study, there's some interesting implications about the long-term price elasticity of demand being lower than the short-term elasticity of demand. That is the opposite of what I'd expect if pricing were the determinant, and exactly what I'd expect if advertising were. Regardless, to the extent BC's carbon tax has worked, I view it in the context of doing little foolish with the revenue. Which returns me to my Ontario, and its vile finance minister's intention to introduce cap-and-trade revenues in its next budget. ...Sousa must table his budget before spring in order to make the necessary legislative and regulatory changes. This planning work to date has been done by the too oft buffoonish Ministry of the Environment...and Climate Change (MoECC). GOVERNMENT OF ONTARIO - MINISTRY OF ENVIRONMENT AND CLIMATE CHANGE "FARTING CAR" from Alter Ego Inc on Vimeo. In March 2015 the government appointed a Climate Action Group composed of "academics, business and civic leaders." The group lacks diversity, being light on engineers, economists, and colour. Political commentator David McLaughlin notes composition of the group means cap-and-trade is coming. In April the government announced: "Ontario intends to join the cap and trade system under the Western Climate Initiative. Under the cap and trade system, businesses will have their own greenhouse gas quota and will then be able to sell it if they don't need it because of their own efficiency." The Climate Action Group worked quickly without the baggage of economics and engineering in the comfort of pre-determined outcomes. In November Cap and Trade Program Design Options was posted to a government site under the guise of "seeking comments on the design options under consideration for Ontario’s greenhouse gas cap and trade program." The "Design Options for Discussion Purposes Only" doesn't discuss the issues of non-tariff barriers and failure to reduce emissions of all other cap and trade systems. In terms of electricity in Ontario, the discussion paper states, "Emissions attributable to electricity generation would not be eligible for an allocation free of charge." There is no indication the MOECC's appointees understand Ontario's industrial pricing strategy for electricity requires the Hourly Ontario Energy Price to be very low - and that price is often set by the cost of natural gas. I've written that a carbon price of $100+/tCO2e could be introduced to Ontario's electricity sector without impacting most consumers, if the tax revenue was kept within the sector to reduce the global adjustment. The reason that is not done is it would drive up the market rate, which would stem losses on exports but drive up the price for Ontario's large, Class A, consumers. November's Cap and Trade Program Design Options offers the worst of all worlds for electricity: revenue will be low, extracted from ratepayers to gift other sectors, and the pricing damage will be disproportionately greater for large industry. What should Ontario consider in establishing an administrative penalty scheme? I've never met anybody useful looking forward to more bureaucrats to explain their productivity to - but that seems to me the essence of this plan. 1. I was surprised when the US Congress extended tax credits for wind and solar this September, and hopeful some of the number of excellent commentators I follow would estimate a price per ton of reduction of CO2 equivalent emissions (tCO2e) offered. I never did see one. One very good commentator responded to my question on cost with, "[number] would be high. [Very] tough to justify on direct emissions impact alone. Have to think of as technology policy." A quarter of a century since the wind subsidies began in earnest, and with the favourite to be the Democratic party's nominee having stated she, "will make the production tax credit for wind and solar permanent," the disinterest in the cost of policies, and the disinterest in economic theories questioning "learning by doing" strategies.